Saint Joseph of Arimathea was a prominent Jewish leader during the time of Jesus Christ. He is mentioned in the Gospels as being a rich man from Armiathea who was a secret disciple of Christ due to his status in the Sanhedrin. After the crucifixion and death of our Lord, Joseph approached Pontius Pilate out of piety and asked for the body of Jesus so that he might bury it honorably. 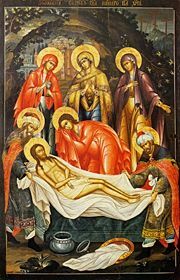 He, together with Saint Nicodemus, removed the body of Christ from the cross in the presence of the Theotokos and the Myrrh-Bearing Women, wrapped it in a linen shroud, anointed it with spices, and laid it in a new tomb that he owned. This disciple later traveled the world proclaiming the Gospel until he reposed in peace in England. The Church commemorates him individually on July 31st and along with the Myrrh-Bearing Women and Nicodemus on the 3rd Sunday of Pascha (the Sunday of the Holy Myrrh-Bearers). Share the feast of Joseph the Righteous of Arimathea with an icon greeting ecard.